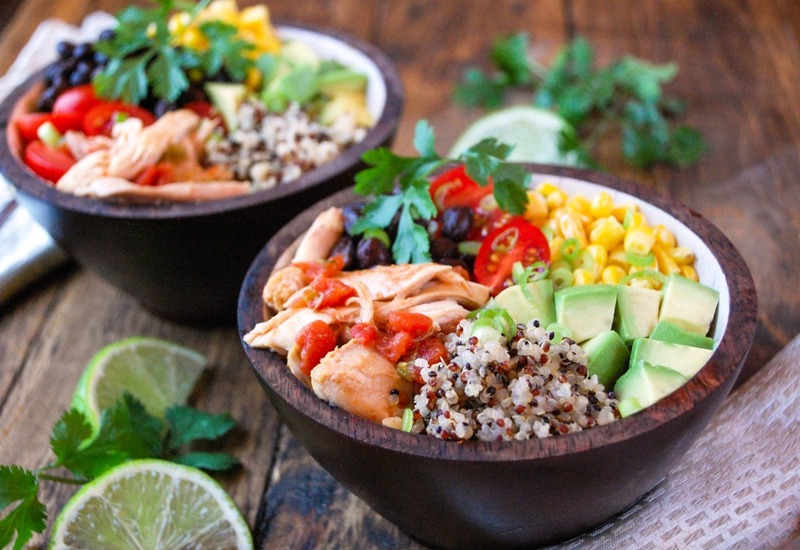 These Chipotle Chicken and Quinoa Bowls are a healthy and delicious 30 minute meal. Chicken thighs are coated in a chipotle-tomato sauce and cooked in the MultiPot pressure cooker. Instead of using rice, these bowls use quinoa as a trendy and healthy swap. The colorful bowls are served with a variety of vegetables and you can customize your bowl to suit your taste preferences. This recipe is not only a great weeknight meal, but they are also perfect to pack for lunch the next day. Mix tomatoes, half the green onions, garlic, cumin, chipotle chili powder, and ½ teaspoon salt together in a bowl. Arrange chicken thighs in the bottom of the pressure cooker pot. Pour tomato mixture over the chicken. Stir water, quinoa, and remaining ½ teaspoon salt together in a 1-quart stainless steel bowl that will fit into the cooker; place on rack in cooker. Remove quinoa bowl and rack. Shred chicken directly in the pot using a pair of forks and stir to coat in sauce. Divide quinoa, shredded chicken, black beans, corn, tomatoes, and avocado between four bowls. Spoon extra chipotle-tomato sauce over quinoa. Garnish bowls with remaining green onions to serve. Bowls are fun meals because they are so customizable. If you don't like the vegetables listed, feel free to use what you like or have in your kitchen. You can also add toppings such as grated cheese, or something to add texture, such as pumpkin seeds. Looking for more spicy/Cajun flavors? Try our top-rated pressure cooker paella! Per Serving: 404 calories; 16g fat; 34.0g carbohydrates; 36g protein; 138mg cholesterol; 800mg sodium. Essy meal prep. Love making quinoa in my pressure cooker - perf every time. This bowl was so delicious! I now love this combination with quinoa, better than using rice. The cumin and chipotle chili powder is so flavorful. Such a great weeknight dinner. Very good quinoa bowl! I've made this recipe twice already and used shrimp the second time. Simple and delicious, and can be prepped the night before (without chopping the avocado). I love this recipe because I can make two separate dishes essentially, chicken and quinoa, in a single pressure cooker. I used chicken breast instead of thighs, pinto beans, and diced tomato tomatoes for topping. This is one of my favorite bowls, for sure. Love these bowls, I make them for my meal prep at least once a month. I usually use chicken breast, but everyone in awhile use pork.